In playing sports we experience a whole spectrum of emotions from the thrill of victory to the agony of defeat. Sports teaches the importance of hard work, persistence in the face of overwhelming odds, and the ability to handle stressful situations and injury. When injured, how soon you can recover is influenced by your physical and emotional resilience. Can Playing Golf Injure Your Hips? Your hips have an important role to play in the game of golf. They are the bridge between the legs and the body ensuring the correct form, generating power, and shifting your body weight during the golf swing. Today, hip replacement surgery has advanced to such a degree that it may be performed as a minimally invasive outpatient procedure with discharge on the very same day for some candidates. In other cases, patients may be discharged home in 5-6 days. Hip replacement surgery can be a life-changing step towards significantly reducing hip pain and improving your mobility. Whether it’s a hip fracture or hip arthritis that has prompted your decision, before you undergo the surgery you must get your home ready for your return. Hip arthroscopy is a cutting-edge procedure which allows your doctor to look inside your hip with a miniaturized camera inserted through a small poke-hole incision. Robotic surgery or robot-assisted surgery is the use of cutting-edge robotic systems controlled by a skilled surgeon to perform surgical procedures. These advanced systems provide the surgeon with a high degree of stability, precision, and control. Often, a hip injury or a degenerative joint condition of the hip will cause you to move the hip joint less. This will naturally result in weakening of the surrounding hip musculature. 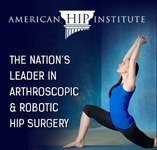 Getting fitted with a completely new hip joint through a small incision may seem like science fiction, but this is possible today thanks to the significant advances in medical science and technology.